It’s the last day of Diabetes Awareness Month. I want to say a big THANK YOU to everyone who participated in the #MakeDiabetesVisible Photo Challenge and awareness initiative. It has really warmed my heart watching this idea grow. 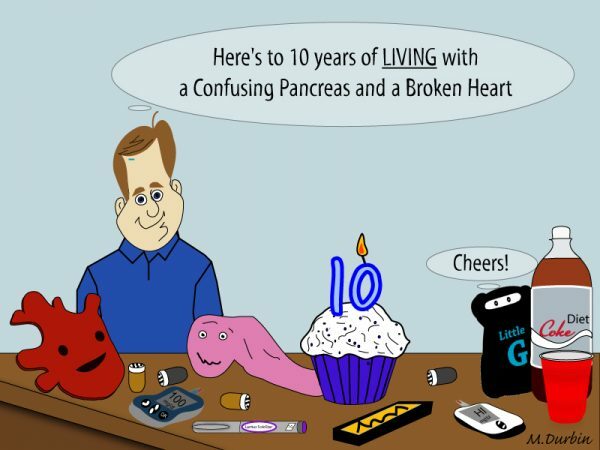 Thank you all for sharing your diabetes life with the world. The good, the bad, and the completely ridiculous. Lots of love!  Also, I received my first shipment from mySugr today. I’ve been curious about the Accu-Chek Guide meter for a while and want to see if the bundle plan will work for my needs right now. Time will tell. It’s the friendships with fellow people with diabetes that make this life bearable. Asha Brown, founder and executive director of We Are Diabetes, is one of the best! I’m thankful to count her as one of my closest friends and as a sister. Some days, my diabetes and GI issues get the better of me. This has been one of them. This cartoon from my archive captures how I’m feeling tonight.